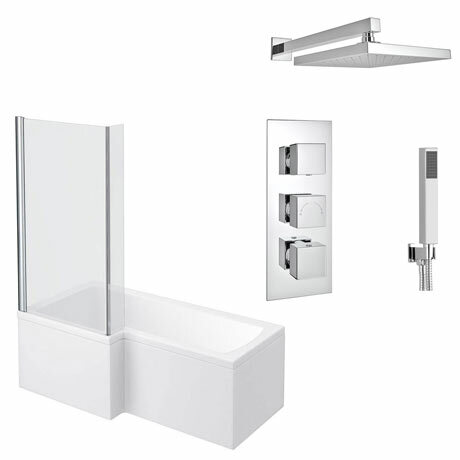 The Milan shower bath with concealed thermostatic Shower package, features a stylish overhead, rainfall type square shower head and a handset too, for extra flexibility. Modern shower baths which allow showering and bathing space in the bathroom. This 1700mm shower bath comes with a hinged bath screen and matching front panel manufactured from high quality gloss white acrylic. All of our shower baths are available in left or right hand configuration, and are the new ideal solution for families looking to add a little luxury, whilst keeping an eye on space. Please note: Shower valve will not work efficiently on a gravity fed tank system, unless a correct booster pump is installed. Please note: Shower head chrome plated plastic, not metal.